Yajnavalkya had two wives Maitreyi and Katyayani. 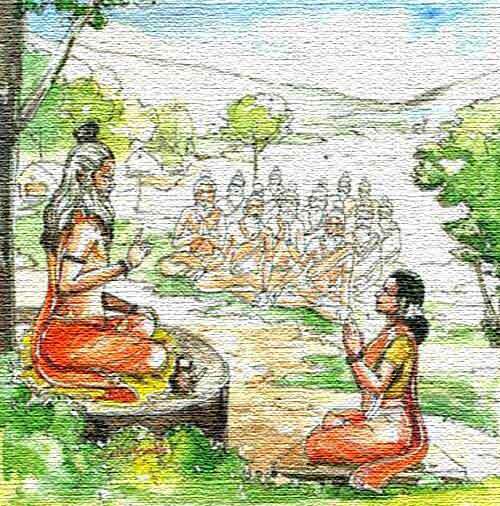 Stories and teachings associated with them are found in the Brihadaranyaka Upanishad. Here is a look at the symbolism of the two wives of Yajnavalkya. Maitreyi is the symbol of real student and Katyayani is grounded in reality of this world. The great sages of ancient world who composed the Brihadaranyaka Upanishad purposefully gave the Acharya Yajnavalkya two wives. The two wives simply represent two parts present in a person - the part that seeks knowledge (Maitreyi), and the part that is grounded in reality of this world (Katyayni). The talks of renunciation, non-attachment, love-yourself, etc are great and help us learn a lot, but we should not forget that we do all this contemplation while being present in this world. This is what Kaatyayni is reminding us. Everything that Katyayni asked and said in Brihadaranyaka Upanishad needs to be given as much importance in our quest for understanding as the remarks and questions of Maitreyi. Only then can we have a complete spiritual understanding of our connection with things worldly and non-worldly. Only then we can truly understand how to balance the two, and how to interact with the two. Source - Inspired by a comment on the Upanishad Ganga Yajnavalkya episode.